Owning a hot tub is an exciting opportunity to make lasting improvements to health and well being. But, it’s also a smart family investment that’s sure to bring fun and entertainment to loved ones. Ready to invest? Here are the three more benefits of hot tub ownership. Better, Longer Sleep – A good night’s sleep is important for looking and feeling your best, but can be tough to get. When it’s time to slow down and unwind from a busy day, a dip in the hot tub delivers. A few minutes of targeted massage and warm water is the key to a peaceful transition from awake to sleep. Easy Relief From Muscular Aches and Pains – Pain interrupts life, and can be tough to manage. Whether it’s temporary, or chronic, relief is priority one. With elevated, sustained heat, a hot tub targets the entire body at once with soothing heat. As heat penetrates the skin, muscles relax, easing tension and stiffness and relieving pain. Year Round Entertainment and Fun – With year round access, a hot tub makes it easy to stay connected with busy teenagers, an overworked spouse or a close friend. Watch a movie under the stars, have meaningful conversation, or just relax in pampered comfort from the privacy and convenience of home. So Go Ahead, Take a Soak, You Deserve it! – It’s, fast, fun and relaxing. Not only that, it’s good for the body, soothes the mind and can improve your overall health and well-being. 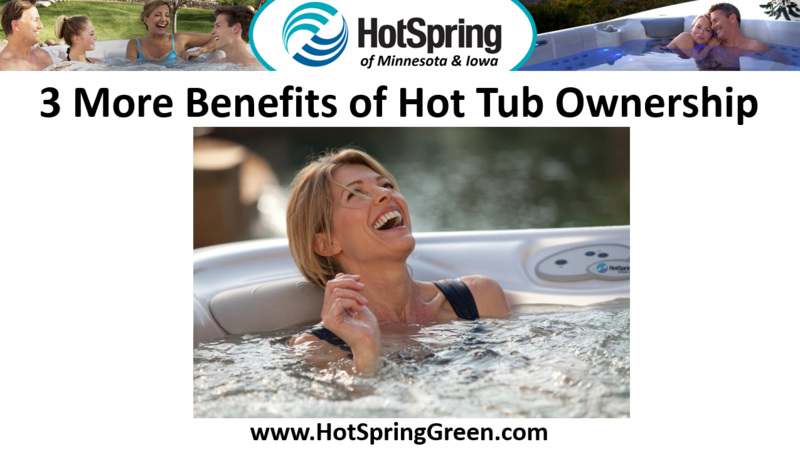 To encourage local residents to check out the benefits of using a hot tub to help improve their overall health and well-being, Hot Spring Spas is providing free test soaks at all our showrooms. We do recommend, however, that people wanting to schedule their free 30-minute soak call us ahead of time to reserve their spot.